Earlier today we were poking fun at the official 3G mobile hotspot apps for the DROID X and 2 on Gingerbread because they erroneously told us to go sign-up at att.com/mywireless in order to use the service, but we should have dug deeper. It’s now looking like the feature is free on both devices as long as you are on Gingerbread. As far as I can tell, this hasn’t been the case up until now, so maybe with this version of Android 2.3 not being official, it’s possible that it had not been turned off yet? 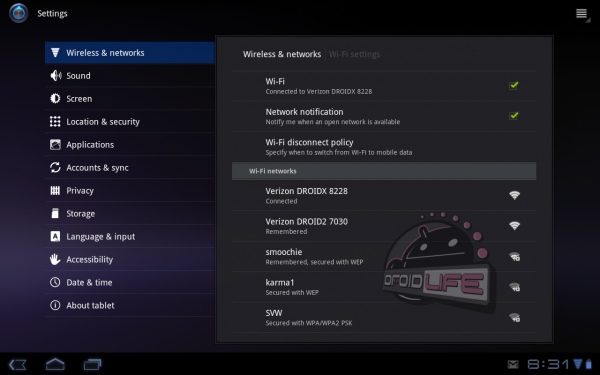 As you can see in the screenshots above, I’ve successfully tethered my DX to my XOOM over 3G. If you do decide to use this, understand that we have no idea how this could affect your bill. What we do know is that tethering really gobbles up data, so you might want to be careful. Anyone else? Am I just out of the loop and this service has been free for a while? Maybe they decided to make it free along with the Thunderbolt until May? And we’re talking the official 3G mobile hotspot app, not a 3rd party app like Barnacle.